The JSCARC and CLARC joined talents, skill, and sweat equity, to once again continue the annual tradition of holding Field Day at the Gilruth. There were so many special activities that happened, and without any problems nor issue. A terrific time and an awesome event for the radio community. It’s not even field day, but Murphy’s Law has arrived. 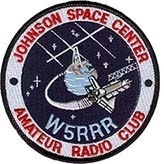 The W5RRR shack back doorlatch is broken. Completely kaput. 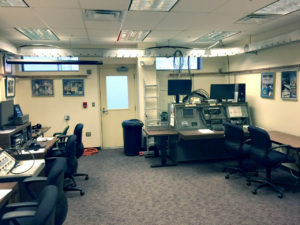 The 20m Yagi has degraded to the point there is no discernable resonance and the defective feed connection is causing splatter during transmit. The 15m Yagi has now gotten worse. Resonance has shifted to 21.7MHz. The IC-781 is broken again. Intermittent TX and RX. Perhaps lose internal connector. On the antenna patch panel, the SO-239 threads assigned to the 15m antenna have worn down. All PL-259 push-on connector shells make unacceptable contact. Not a big deal but needs attention. 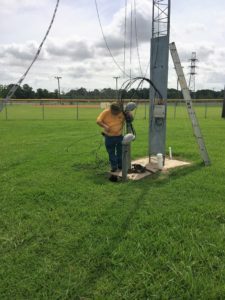 N5FWB pretends to build a new antenna from scratch. Great turnout from club and CLARC to knockout preparations for next week’s FD. 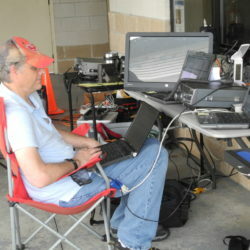 At 3:30pm it was a nice hot 95 deg day to visit superham Bryon, W5FH at his QTH in Alvin. 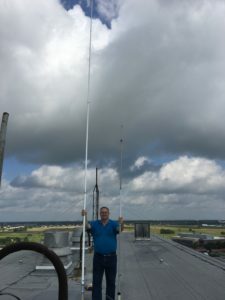 Bryon had an incredibly great condition TH7DX 20/15/10m triband 7 element yagi for sale, and we luckily snagged it to replace our tired HF yagis ontop W5RRR 80′ tower. 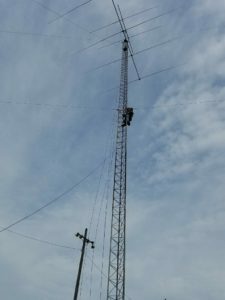 Bryon’s shack was easy to spot, since he has two monster 100′ towers with an impressive array of HF /VHF/UHF antennas. On June 1, a trip up the roof of Building 30 was made by KG5HOK, N5FWB along with JSC Security. After guidance at the last JSCARC meeting from Ken, K5RG, and reading on-line comments, I successfully completed my first climb of Mount Gilruth (aka the 80’ W5RRR tower). Actually, I only climbed up a bit beyond the rotator, so the actual summit measure was more like 70’. A few comments posted here, which may aid future, ham trekkers. 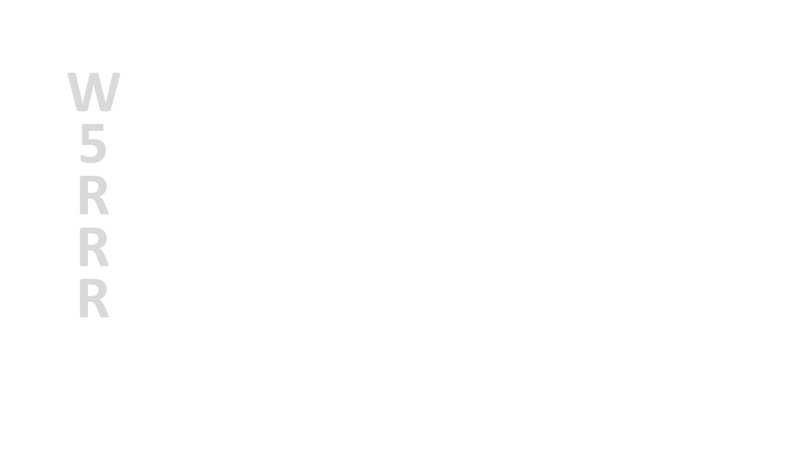 Some comments are reinforcing messages from Ken, and some are my own lesson’s learned. My forearms were straining as time wore on. Why? Because, as Ken advised, get a very short positioning lanyard as possible. 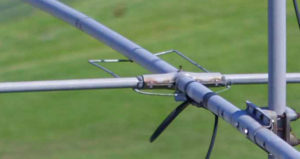 The positioning lanyard, which comes in a variety of lengths, ties your body to the tower and allows one to lean back a small amount, and redistributing your upper boday weight from your forearms to the lanyard cord. 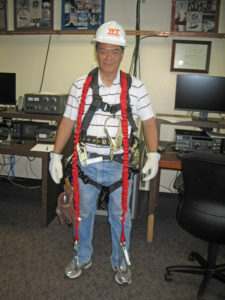 My mistake: I bought a medium length positioning lanyard- I thought it was good enough, but for it to work effectively, I would have to really lean uncomfortably backwards for the cord became stretched out enough to share my weight. Yes, I could have used it but as a newbie, there was no way I was going to lean waaay back from the tower to exploit it’s weight distribution property. I elected instead to completely not use it (even though still clipped in) and instead relied on my forearms to assume the bear hug position to keep me safe. Buy as short a positioning lanyard as you can. a smooth 1 hour duration climb up the ladder on June 31 5PM. Weather was perfect and breeze was comfortable. More photos to follow, but the biggest surprise was to find that the pulley holding up the Windom endwise was jammed. The cord had slipped off the roller and was jammed in-between the roller and the inside shell. Previously, we thought the pulley was intentionally disabled and tied down permanently.